Halloween is right around the corner! That means it’s time to break out the candy and the costumes. You may love this time of year – but all of the Halloween-related changes going on could potentially mean trouble for your dog. To keep you and your furry friend safe, it’s best to play by the following ground rules. This may seem like a no-brainer, but it’s easy to forget that you left the bowl of trick-or-treater candy next to the front door. Make sure that all Halloween candy is stuffed out of reach so that your dog doesn’t get into the chocolate. Chocolate can be highly toxic for dogs – causing cardiac failure and seizures in a worst-case scenario and vomiting and diarrhea in a more mild case. Either way – not something you want to worry about on Halloween (or ever)! Having an in-ground electronic fence can certainly keep your dog in the yard on Halloween. But that doesn’t mean some over-eager trick-or-treaters won’t cut through your hard to get to the next house on your street! It’s best to monitor potty trips by leashing your dog or going outside with them for brief periods only. While you may think that the ghosts and ghouls coming to your door are adorable – Fido may feel otherwise. 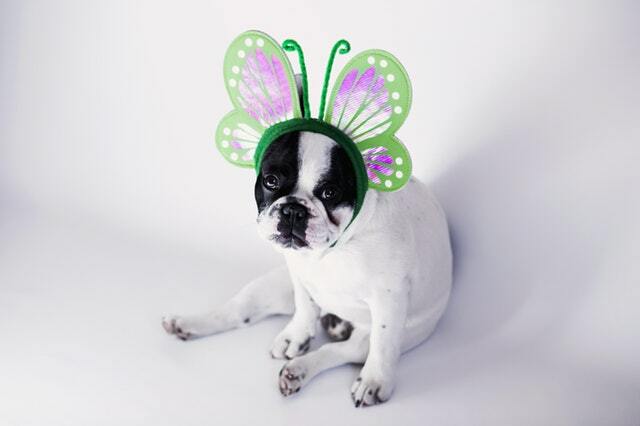 Costumes can be scary for dogs, and the constant knocking at your door might make them very anxious. Make sure you have a closed-off area for your dog when you answer the door, or someone to help you manage them and their inevitable excitement. Watch Out for the Pumpkins! While some dogs love pumpkins – make sure they eat it in moderation! Anytime you dramatically change a dog’s diet you run the risk of upsetting their stomach. If they should get into your jack-o-lanterns while you’re not looking you could have a real mess on your hands. Hard plastic decorations or those extra spooky netting spiderwebs may make you the scariest haunted mansion on the block. But if your dog can’t digest many of the decorations commonly sold in stores around Halloween. This could lead to severe intestinal blockage or an upset stomach. Place all Halloween décor above your dog’s level. The dog costumes available this time of year are too cute! If you choose to dress your pet up this Halloween, make sure you get them a costume that isn’t too tight or so loose they’ll trip over it and hurt themselves. It’s also a good idea to try it on in advance to make sure they’re comfortable with it. Finally, don’t purchase a costume that they could chew parts off of – we don’t need a choking hazard! Ultimately, the calmer you are, the calmer your dog will be. Holidays can be both exciting and upsetting for dogs because there’s so much change going on at once. This can lead them to act out, or react in ways you wouldn’t expect. They may be more likely to dive into the candy bowl while you’re not looking, or try to bolt out the front door if they’re feeling anxious. Do the best you can to keep Halloween night normal for your pup. If you can’t keep things steady, or you need to take your kids trick-or-treating, do your best to create a comfortable environment for your furry friend. Clean bedding, a favorite toy, or a new bone will often do the trick. Work on training your dog to go to their bed, or to a confined area when the doorbell rings with treats and a command. Alternatively, you can use a “sit” or “lay down” command to keep them calm. Giving them a direction they already know can often ease their anxiety and show that you’re in control of the situation – they have nothing to worry about! Working on this training before Halloween is especially important because it can help your pup feel less anxious the night of (and it has ongoing benefits!). All in all, Halloween can still be an enjoyable holiday for you and your dog. Just follow these ground rules and always remember – change of any kind can be intimidating for your puppy! The calmer you are, the calmer they will be. ST. Louis Dog Fence and Perimeter Technologies are not associated with Invisible Fence®, Dog Guard®, Dog Watch® or PetSafe®. These trademarks are the property of their respective owners.